Yesterday was a nightmare. Apparently there was a tornado in Roscommon town where I was shopping yesterday but I missed it. It wasn't in Lidls, Aldis or Tescos or Dunnes is all I can say. We got home about three o'clock and then the wind really did hit the fan. Torrential rain, wind...gales and storms thought the day. We got off quite lightly though in that our house is made from solid stone, has two foot deep walls and could withstand most things! We did havd to go out in it to dig some trenches and redirect some water away from the house and my raised beds are now ponds, but hey: it could have been so much worse! The electric pole has come down but someone is leaning a tractor against it to keep the line off the road so we still have electric until they come to fix it. I know...only in Ireland lol. 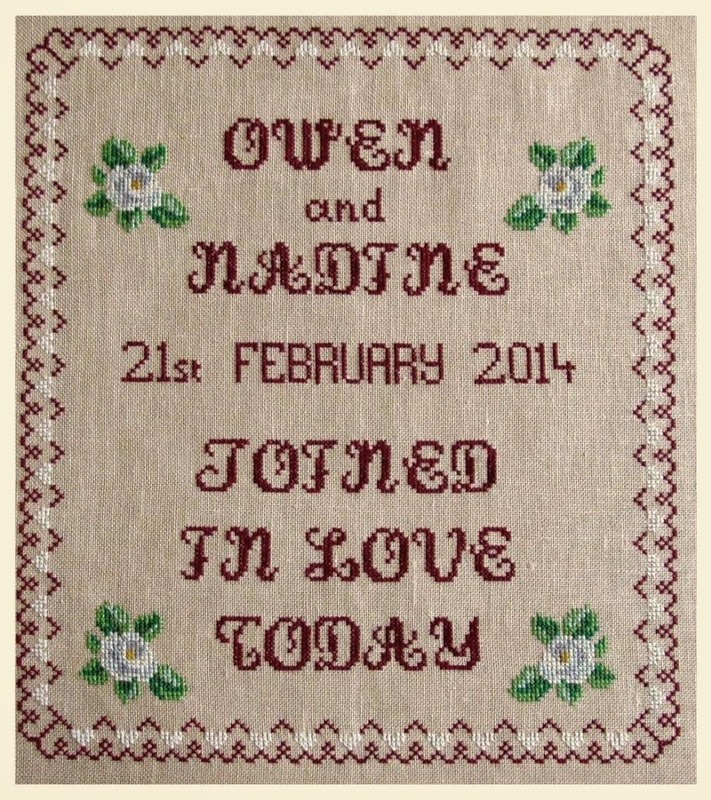 Remember the wedding sampler I designed? Well Elaine sent me a photo of it finished yesterday. She lost electricity so goodness knows how she stitched it! She is pretty amazing isn't she. The light won't be ideal but you can get a gist of it. I think she has done a superb job, really amazing. It is in burgandy to match the bridesmaid dresses and the flowers are her bouquet flowers, ivory roses. I think this would be easy to adapt for anyone's wedding! Undecided if I should offer a personalised sampler chart in the shop..ah well, we can see. I've been busy sewing, coming up with a set to use some of the donated fabric. The rest of it will be cut and turned into a rag quilt but I can only cut fabric for so long before my back hurts so I'm doing it in stages! Will have more to show you next post! Great, beautiful job on the sampler. Nasty weather.. glad you are safe. The wedding sampler is just lovely. That will make the couple very happy! The weather has been odd everywhere, I'm thinking! The sampler is lovely. As for personalization, you could add the alphabet as part of the chart and let each stitcher graph it out for herself (himself, too :)). No need for you to take the time, as you'd probably get the requests just when you didn't have a minute to spare. Your wedding sampler is really lovely... no, beautiful. I love all of your designs, you are very talented. I hope over the years I get to stitch more! That is quite a lovely piece! Congrats! A lovely piece for the happy couple to treasure. Thats really great creativity and i think you can do more better than this at any time.Design is good and use of these color make it more attractive.